Back in March 2012 I have the privileges to visit Flores as a part of a documentary movie crew made by a local Indonesian TV channel, the story is about a local tribes in this remote place in Flores called Kampung Todo and what they have to do to preserve their culture. There are no direct flight to Flores from Jakarta so we have to make a small stop in Bali before changing planes and head to Labuan Bajo in the next day. But this time its not Komodo that being my destination. In the first day I stay in the city of Ruteng, about 4 hour drive from the airport in Labuan Bajo, located in a middle of mountainous area of west end Manggarai. It is a capital of Western Manggarai so I think its quite big by the local standards. "I moved here from Kupang after my divorced a couple of years back" said the 34 years old man, "I just had my leave and travel to see Jakarta and Bali when I met you in the plane" he added. When I arrive in Ruteng its dark already so I dont have anything to look at. But in the morning I was quite stunned to see the surrounding, were surrounded by mountains, no wonder its quite cold in the night.Ruteng is a very religious city from the looks of it. There's even a 15 foot Jesus statue in the middle of an intersection. 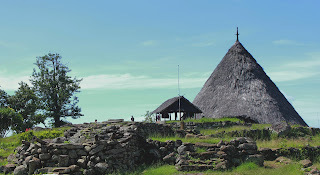 When the dawn break, I hire a car plus the driver and heading to Todo village, 40 KM from the city of Ruteng, we're heading west and descend through a very rugged and mountainous area.After a three hour ride we finally arrive in Todo, the Center of Western Manggarai old kingdom. The Village is located between two big hills and you can actually see Indian ocean from behind the traditional main house . 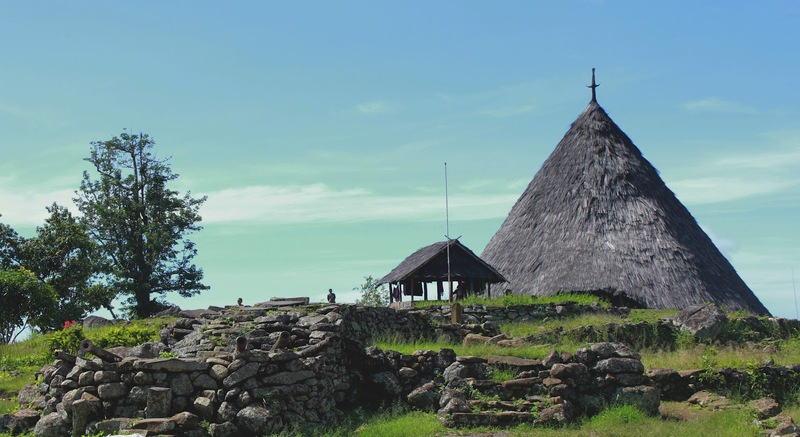 The main house called Mbaru Niang, made only by wood, it had no nails in it and is actually quite big on the inside, and unlike in Wae Rebo village that have three Mbaru Niang house, in Todo there's only one, but it is the Center of Manggarai. The one in Todo is renovated in late the 80's. 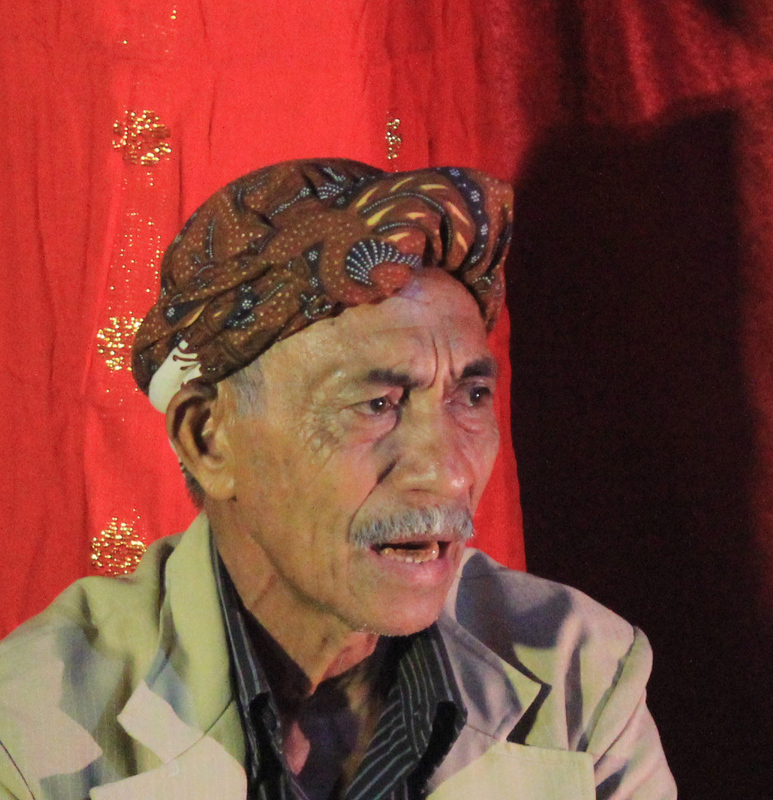 The King of old Manggarai lives in Todo and Wae Rebo is ruled by the Todo king. 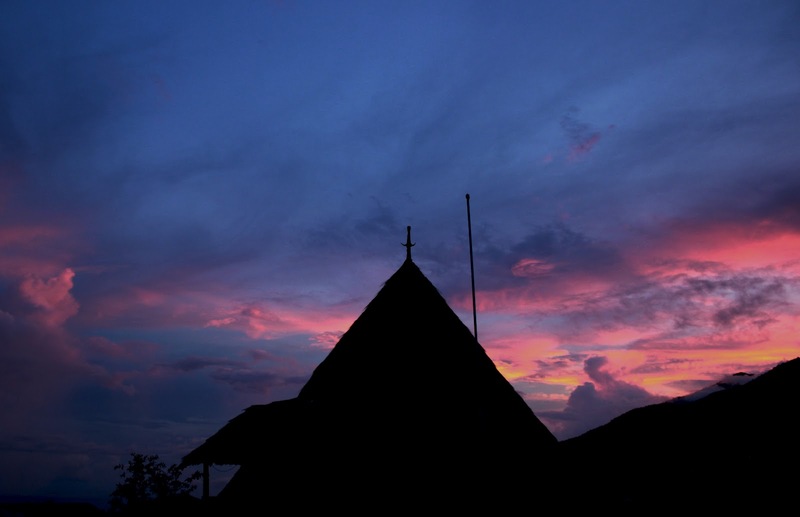 Todo is also the place to host Penti, a celebration and great festival of Western Manggarai. When me and my team arrive, we were greeted with a small festival of local alcohol drinks call Mo'ke and a ceremony, as a symbol of welcome and a sign that the Todos are welcoming us as one of them, we are now officially a Todo. There is no electricity in the Village, although there's power line I saw in the way to the village, but the line stops just 500 meters from the village. Apparently the line have no electric current, but there is a big generator owned by the locals and we can use it to charge batteries etc. Cellphones signal is Telkomsel only. There's a lot of philosophy inside the Mbaru Niang house that we live in but the main idea was it was the sanctuary for the whole tribe. So if anybody comes to Todo they welcome to stay at Mbaru Niang. We share it with a family that is the only one that live and headed by an old man that we called Pak'Tua(Old Man), a 70 year old man descendant from the old chief, that had 5 children and all of his children already built their own houses around the big house. "You and the whole crew will stay in Mbaru Niang, you are all a part of us now, Todo Tribe" said Pak'Tua in his Manggarai accent. At first I thought Pak'Tua is the Chief of Todo but apparently the chief is in Ruteng to visit his son and Pak'Tua is one of the eldest of the village and considered as a shaman for the Todo's. 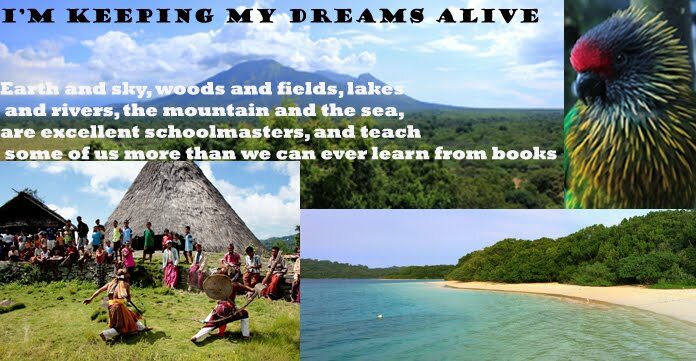 The next day we finally met the Tribal chief of Todo, and He explain to us about the history and stories of old Todo, how they escape from dutch and the guerrilla war against the europeans invader. He also tells us a story how the Todo tribe conquer all of the small kingdom of surrounding west Manggarai, and how come there is still no electricity given by the Central government. First couple of days of the movie making we spend it mainly on the local market and farm, just like every other market in remote places it only take place a couple times a week, In this case its twice a week,Wednesday and Saturday. the stuff they sell mainly is home and daily needs such soaps, toothpaste and groceries, so no extraordinary and strange things we saw. In the weekend I finally have the chance to see something that is quite special in my opinion. The Todo is going to held a "Caci", a local sport in west Manggarai, it involves two warriors dress for battlefield holding sticks and shield made from cow leather and wood, one warrior will attack first using a stick and the other one will be defending and try to repulse using a shield made from leather and vice versa. My favorite warrior is Obin, Pak'tua 4th son and the champion of Caci in west Manggarai, there is a yearly Caci Championship held in Ruteng competing for the regent trophy and Obin is last year winner. Obin told me "I've never been hit even once in a Caci match" there's pride in his voice. There's a lot of to do before organizing a Caci, which involves praying and sacrificing a chicken blood to the ancestors the night before. Although mostly is Catholic, the Todo still practices the culture that handed down by their ancestors. 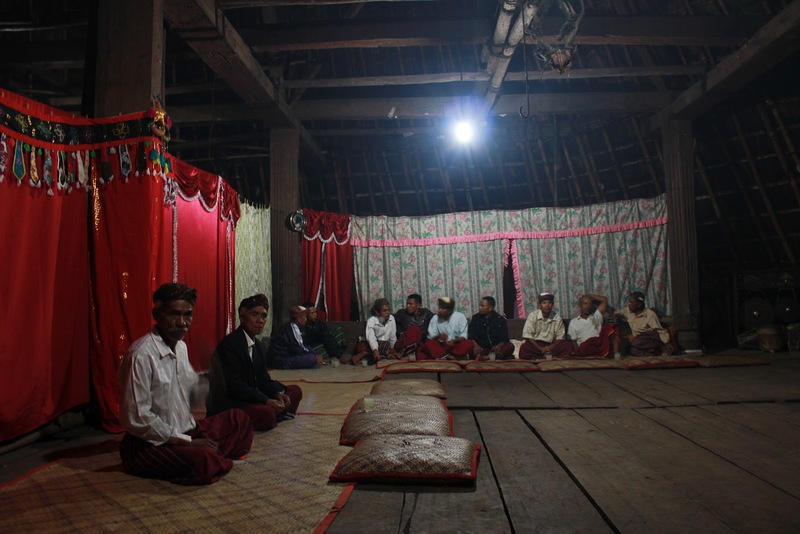 There is also a meeting that attended by the whole village men, so its quite complicated. After a long session of talking and drinking mo'ke it is finally agreed that the Caci will be held in the morning and involving 4 men, two will be the host and the other two will be the contender, Obin and his brother Florin will be the host. Sun is shining brightly in the morning as we prepare for Caci. The Chief explains to me how Caci can only be played without a vengeance, there will be no bloodshed and quarrel after that. The warrior must have clean heart so there will be no fight after and they all must join the ceremonial drinking Mo'ke after Caci. The host assembled in Mbaru Niang and the Challenger gathered in a house nearby. After a quick pray and sing we all head to the front of the big house and the Chief declared that Caci is officially held. The men are gathered in the small grass complex front of Mbaru Niang and the ladies of the village play traditional music instrument. The first warrior couple is Obins brother Flori, " This is my first Caci" he said in a small voice, just 17 years old Flori is still in practice and he wants to follow his brother footstep as a Caci warrior. Flori will hit first and soon the result can be seen, he failed to hit his opponent. "I need a lot of practice before I can establish myself as a Caci warrior" Flori told me with a smile. After that it was his turn to defend against his opponent and this time it succeed in hitting him in the stomach. The bruise is small but I know that is quite painful, "that is nothing" Obin said, "Usually when I hit someone the skin will peel and show the meat inside". Now its time for Obin attack, last year Regent champion, the atmosphere is changing, I don't know what is his opponent thinking but he must have felt it too. It turns out that the Obin is successfully hit his opponent and leaving a peel skin and quite a bruise in his opponents back. And when his turn to defend against his opponent, the shield he carry done the job protecting him. "Well fought" I said in my mind. After Caci the Chief assembled all the village people and surrounded them by the Caci warrior, gave a sermon to the mass.
" We all have been a witnessed of a great show today, I hope there will be no quarrel and fight and discontent about everything, lets all now give thanks to God and enjoying the day with love to each other" He said in a local Todo Language. "What a big heart this Caci warrior have" I thought to myself. They passing each other the Mo'Ke in a leather container as a peace symbol, Alcohol is common as a friendship tool in this part of the world. After the Mo'ke we all entered Mbaru Niang to enjoy lunch prepared by the Todo ladies. Its been a long day of caci in this remote Todo Village and accompanied by Florin I treat myself with a couple of Photograph around the village. The sky is dramatic that afternoon, mostly cloudy but the sun is still visible behind the clouds. Flores sky is always beautiful from the first day but it is stunningly gorgeous particularly today. of Flores and Its people. tribe is Catholic, Old beliefs don't vanished. actually dye it with materials from the surrounding forest. "Sarong" for the big size. made up to a month. sitting there, weaving for a month long. to 200k depending on the complexity. in this beautiful island of Flores. tribe and their challenge against the modern world. "All people are basically nice and friendly" and Todo is exactly as I expected. welcome here again as a part of Todo".